- Novice Tunnelers - (2) 1st places & (2) Q's! 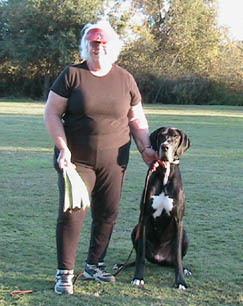 ScoobyDoo, the Great Dane, and I are happy with our performance at last weekend's NADAC trial. We ran all 10 runs and came home with a 4th in Jumpers, a 3rd in Standard and a 3rd in Weavers. We are both jumping up and down. Titled: Novice Weavers (Qualified 1st Place on Sunday) - now Open, Open Tunnelers - now Elite, Novice Touch 'n Go - now Open, Qualified 2nd Place Elite Jumpers, Qualified 3rd Place Elite Tunnelers. Titled: Novice Weavers - now Open, Open Tunnelers - now Elite. Qualified 3rd Place Elite Jumpers - Veteran, Qualified 2nd Place Elite Regular - Veteran, Qualified 1st Place Elite Gamblers - Veteran! Aspen was 1st Place AXJ Title and Qualifier in Excellent B Standard in spite of Tropical Storm Matthew in Florida. 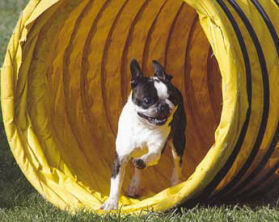 Bruce was especially proud of Jesse's 1st Place Qualifier in Elite Tunnelers! Go Jesse! - Saturday: Elite Reg. Rd. 1 Qualified 2nd Place, Elite Reg. Rd. 2 Qualified 2nd Place & Elite Gamblers Qualified Re Place. Janie received a NADAC Certificate for Outstanding Performance while successfully competing in the Elite Agility Class 8". Dottie finally got her first Excellent A Jumpers Q! We have been trying forever but I kept messing her up. Also Pebbles got her first Q in Open Jumpers. At the Australian Cattle Dog Club Agility Trial Saturday, Sept. 11th, Hattie was the only Qualifier (2 First Places) in Novice B Standard 12" and Novice B Jumpers/Weaves 12" (NAJ Title). At the ACDC Agility trial, Elmo turned in a clean run in JWW for a perfect 100 score, fastest time, and thus a first place! This was his first Q in Open JWW. Elite Gamblers 20" Qualified 3rd, Elite Regular 20" Qualified 4th, Elite Regular Qualified, Novice Touch N Go Qualified 3rd, Open Gamblers 20" Qualified 1st Place! Open Touch N Go Qualified, Elite Jumpers 20" Qualified, Elite Regular 20" Qualified 3rd (Saturday), Elite Regular 20" Qualified 3rd (Sunday) and Elite Regular 20" Qualified 1st Place (Sunday)! At Wags for Wishes in June, Sandy & Lil Q'd in Excellent B Standard (19 pts towards MACH). Hattie (pictured at left) in her first trial was 1st place and Q'd in Novice B JWW on Friday. She was 1st Place and Q'd Novice B JWW on Saturday. A knocked bar kept her from a Q in Sunday's Novice B Standard. Bruce & Janie double Q'd on Friday of Wags for Wishes! At Wags for Wishes, Pebbles Q'd in Novice Standard and now moves up to Open! Also 2 Q's in Open Jumpers. Dottie Q'd in Excellent A Standard and is now up to Excellent B! Coal Q'd with 2nd place in Novice A JWW at Wags for Wishes on Saturday and passed his CGC (Canine Good Citizen) on Sunday. At Wags for Wishes in June, Chloe Q'd in Jumpers on Friday for her first leg in Open. We were very excited since we just moved up from Novice! We trialed on Sat/Sun at Wags for Wishes with the following accomplishments! Hanna Double Q'd both days Excellent B.
Sophie got two first places on Saturday and a 1st place on Sunday Excellent AP. Shooter got his third Q in Excellent A Standard and titled! He ran well on Sunday in Excellent B but no Q.
Wags for Wishes in Del Mar, Winston Q'd on Friday July 9, 2004 earning his second Q in Open JWW 20"!! At the Shoreline Trial in June, Elmo got that final Q he'd been needing to finish his NAJ title. It is now Open classes all the way for this duo. Elmo got a score of 98 (two seconds overtime) and a second place! Plus at Wags to Wishes in Del Mar, Elmo earned his first Q in Open Standards on Saturday! At the Shoreline Trial in Mission Viejo, Winston Q'd with 100 points and took First Place in Open JWW 20". I pulled off one of those Leadout Pivots and threw in a blind cross for good measure! The course was 122 YDS, SCT was 35. Winston's time was 29.79. Star Q'd with 100 pts and came in Second in Open Standard 20". She was wonderful, but the other dog beat her time by 1/2 second or so. 158 YDS, SCT 68. Star's time was 46.47. 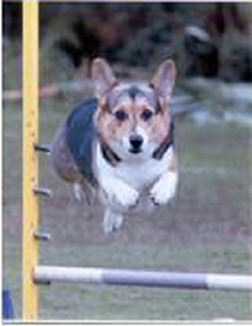 At the USDAA Agility Club of San Diego Trial June 5 and 6, 2004, at Rohr Park, Sandy's students were stellar in 22" Starters Standard! 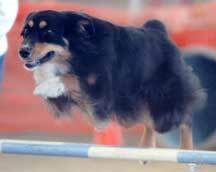 In a class of 22 dogs, fewer than 10 dogs qualified. Shooter and Bobby Jo Cook qualified with a 1st Place, Shayla and Jennie Brennan qualified with a 2nd Place and Dottie and Diana Walker qualified with a 3rd Place! Bobby Jo's Sophie and Hanna qualified in Masters Snooker. Shooter and Kathy Upton's Gamma qualified in Starters Pairs. Shayla also qualified with a 4th Place in Standard on Saturday and Qualified with a 3rd Place in Jumpers on Sunday. 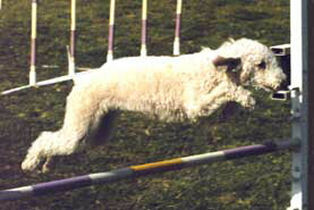 At the USDAA Agility Club of San Diego Trial on June 5 and 6, 2004, Lil earned her AD (Agility Dog) title Qualifying with with many 1st, Boston and 3rd Placements 12". 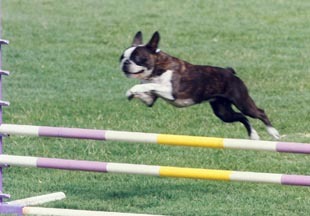 Geronimo qualified with a 1st Place in the Starters Snookers 16" and Qualified with a 2nd Place in Starters 16" Jumpers. Bruce earned a Super Q with Janie in Masters Snooker 12" with a 2nd Place. Lil titled AX with two 1st Places. Now on to earning a MACH. Geronimo titled NA. Now he is in Open. Bruce Double Q'd twice with Janie. At the Mission Circuit trials in May, Hanna - Double Q'd Saturday and Sunday (Excellent B 20). Shooter - Q'd with a 1st Place Saturday and Sunday (Excellent A Standard 20). Sophie AX AXJ - Q'd with a 1st Place Saturday (Open P Standard 20), Q'd with a Boston Place Saturday (Open P J/W 20), Q'd with a 1st Place Sunday (Open P J/W 20) and Titled in Open P -Now Excellent AP! The NADAC trial resulted in a few more titles! Lil finished her Elite Agility Certificate and her Novice Touch N Go Certificate--a first place on that one! She earned first and second place ribbons on all her Q's! Janie took a few firsts, too! Geronimo also finished his Open Gamblers Certificate! 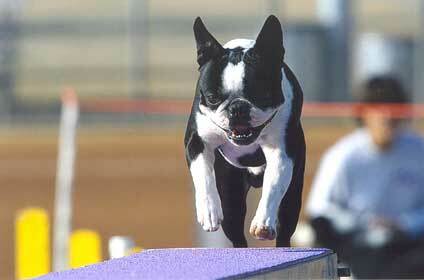 Pepper FINALLY earned his Novice Standard Title on Sunday 4/18 at the Agility Club of SD's NADAC trial. He took a THIRD place and Q'd, which is the most important thing. What makes this SO special is that this Q has eluded Team Gallina for over a year..much to the handler's (Monica's) dismay! Pepper is now in Open Standard. After this exciting achievement he also Q'd in ELITE GAMBLERS, his first Elite Q ever! Thanks, Sandy, for keeping me going! Star didn't completely have it together at the NADAC trial, however, in Gamblers on Saturday in the pouring rain she managed to complete the gamble with 28 opening points and finished her Novice Gamblers Certificate! The best run I had all weekend was Winston's Q in Open Tunnelers on Sunday. We completed the course in 33.68 sec. (SCT was 40). There were some VERY fast dogs in the 20+ class and even with that fast time, he came in 9th place. The old guy can still move (just turned 8 in March)! I can't believe this little guy! We trialed only on Sunday at the recent NADAC trial and he had NO obstacle faults the entire day. We came home with THREE Qualifying ribbons in the 4 events we ran in. He had a lot more competition in his class this trial and still managed to get a FIRST Place in Novice Gamblers (including the bonus jump). He also qualified in standard finishing 4th out of 7 competing AND qualified in his first ever tunnelers run finishing 6th out of 15 dogs. He now has 1 Q in each of his NADAC class in only 2 trials! In Jumpers he was 4th out of 9, but not under time for his Q. Our secret is PRAISE, PRAISE, PRAISE! Keep everything positive! That's what motivates Coal! 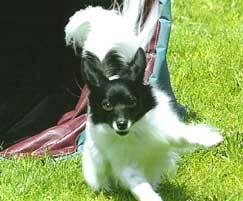 I really enjoy the Agility days with Coal and he seems to really enjoy himself too now. Thank you, Sandy, for giving us both the confidence that we could do this together! Gamma did well at the recent AKC trial and Qualified in Novice Jumpers both Saturday and Sunday! Considering that she went around EVERY jump at the NADAC trial, this is a great improvement! She gets to join Chloe in Open Jumpers (not Standard yet, but soon on that too--she missed a Q by an "up" contact on a teeter on Saturday). I see her gaining confidence with every trial (only 4 total entered since January so far) and she even held her start line stays at this one! She's getting the idea of the purpose of the game! (Sorry, Pilot, but Gamma has already overtaken you on that ribbon wall! 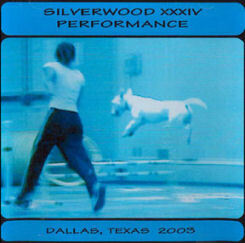 Star was awesome at the Silver Bay Kennel Club AKC Show Saturday Feb 21, 2004. She Q'd in both her standard runs and finished her Novice Agility Title! At the NADAC Trial in Dehesa, Star, who had never done Gamblers at a trial before, had 2 great runs. In Round 1, I ran out of breath after racking up 40 opening points and didn't give her the command for the last jump soon enough. In Round 2, she was perfect and came in 2nd place! 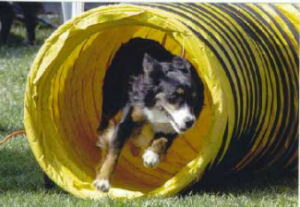 What fun it was — a weekend I will never forget, Coal's first Agility trial! Everyone...a life lesson...not giving up DOES pay off! Coal's been in agility training since last May and has been a very difficult Papillon with his combination of attitude and a lack of confidence, as well as being hard to find a way to motivate him in training (even Sandy admits he's been a challenge)! This weekend at the NADAC trial (3/13 & 14), we came home with 3 Blue ribbons, 2 Red ones, 1 Yellow! He earned a FIRST PLACE and QUALIFYING ribbon in his first Jumpers run ever! WOW! It was a blast and I'm still trying to come back down to earth! I think I'm hooked! After taking almost a entire year off of competing, Shayla returned to NADAC competition in March, 2004. She qualified 4 out of 6 runs, with 2 of those being first place runs. She took first in her elite gamble to complete her title, and she took first in her standard run on Saturday. Sunday one of her qualifying runs was her first leg toward her elite jumpers title. Bruce remarked that my run had the most crossing he had ever seen me put in! So I guess I should say WE had a good weekend. Thank you to Sandy and the gals in my class for pushing me to be a better handler! Lil finished her NADAC Elite Jumpers Title on March 14 with a 1st Place! She also recently finished her AKC Excellent Jumpers with Weaves title! At the Silver Bay AKC trial, Chloe finished in FIRST place in 16" Novice Jumpers on both Saturday AND Sunday for TWO Q's! She also Q'd in Novice Standard on Sunday in the rain! Three Q's in one weekend! Geronimo finished his AKC Novice Standard title at the Portuguese Water Dog club's trial at the beginning of February with a 1st in the 12" class. Then at Silver Bay's trial he finished his Novice Jumper with Weaves title, also with a First place in his class! What do agility friends do in their free time? 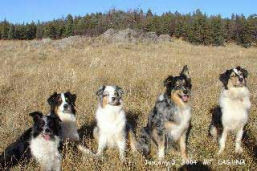 Here's a photo of Bobbie Jo's pack (on the left) and Monica's pack (on the right) during their hike at Mt. Laguna! 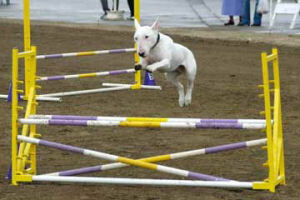 Jessi and Elmo (Bull Terrier) were chosen to be featured on the Agility Video Cover for the Silverwood Specialty Show! At Silver Bay, February 21st, Elmo & Jessie earned a FIRST in Novice Standand and 2nd in Novice Jumpers: TWO Q's on the same day! 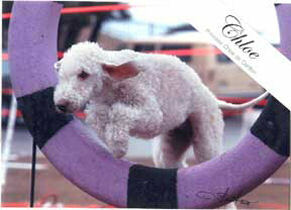 Then in Arizona, Elmo earned his 2nd Q in Jumpers and his 3rd in Standard and now...it's OFFICIAL! Elmo finished his Novice Agility title! We're so proud of him and Jessi! Dottie says THANKS to Sandy! Her handler finally got it right! We had the best weekend we've ever had! Dottie made the gamble on Saturday but didn't have enough points to Q. In Starters Novice she Q'd BOTH Saturday AND Sunday, and also Q'd in Snooker and Jumpers! Pebbles has gone to 2 trials. The first was in Pomona in December (AKC), where she Q'd in Jumpers with Weaves. At the recent USDAA Trial she also Q'd in Jumpers, although we're still having a little problem with the weave poles! Thanks again, Sandy!